We’re already on to recipe #2! And, as promised, this recipe is much less involved than the last. I am sometimes crumby and mean in the morning and love to have the company of a muffin that cheers me up with its crumby topping and mean blueberry flavor! We ate these with John’s nephew Jesse who said “um, I didn’t ask for blueberries in mine” and then after the first bite followed with “mmmm, yeah I guess I like it.” Enough said, we gobbled them down! This is a pretty basic muffin that is a little fluffier than most. 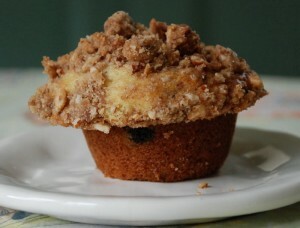 The muffin itself is not super sweet but the crumb topping is. If making the muffins without the crumb topping, I would definitely use a little bit more sugar. Makes one dozen muffins (sometimes only 11 if you want them to be giant). If you are sometimes too crumby and mean to bake in the morning, but would be cheered by fresh muffins not long after you wake, you can prepare the recipe the night before and refrigerate them in the muffin tin. Just pop in the oven and add a couple of minutes to the baking time! This recipe is based on Joy of Cooking’s Streusel #1. It is crunchy sweet goodness. In fact the only thing crumby about it is the big mess it makes when it crumbs itself all over the place! Whisk, sift or food process the flour, baking powder, baking soda and salt in a large bowl, set aside. Carefully attempt to remove a muffin. If you haven’t used liners, run a knife around the edge of the muffin to loosen it. If the muffin falls apart or doesn’t want to come out, let them sit in the pan a little longer. When you can successfully get them out in one piece, transfer the muffins to a cooling rack and let cool for an additional 5 minutes. Don’t leave them in the tin too long or they may get soggy bottoms or overbake. This entry was posted on Sunday, August 24th, 2008 at 3:37 pm	and is filed under Muffins. You can follow any responses to this entry through the RSS 2.0 feed. You can leave a response, or trackback from your own site. Just had yet another of these scrumptious muffins for breakfast, and it tasted just as good as it did fresh outta the oven. So, I found a tasty little treat outside of my front door today. What a delightful muffin! Plus with the added treat of warmth from the sun…but I don’t see that on the recipe :)! Question: When using frozen blueberries…would you recommend thawing them first or putting them in frozen? Wow! What a nice surprise in my mailbox this morning after getting home HUNGRY after yoga with Kofi. The muffin is so fluffy, cakey and moist and the topping makes it dessert-o-rific! Delicious with a glass of iced ‘Dandy Blend’ instant beverage. I feel lucky to be on the baked goods route! Keep those blueberries frozen until ready to stir ‘em in. Frozen berries leave lovely blue streaks in your muffin. If you want to minimize the blue-ness, you can stir them into the flour mixture before combining with the liquid mixture. I made these the other day as a little gift for a friend’s birthday. 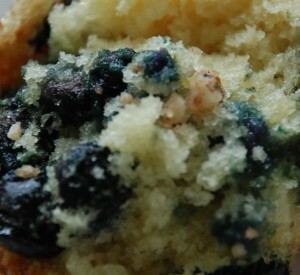 I made the mistake of leaving the blueberries to thaw a bit and my muffins turned out completely blue! No worries, though, they tasted great anyways. The topping is my favorite part! Think I’ll make these for Thanksgiving Bfast when the grandbabies come– I plan to cook and freeze them, a la runawayspoon! xxoo slpk PS Good to have a berry collection!